First, if you are new to The Dark Eye or just curious about it, then there has never been a better time to try it out! Right now, you can get a starter set of essential Dark Eye PDFs at the Bundle of Holding for the incredibly low entry price of $9.95! This includes both the Core Rules and the ENnie Award-Winning Aventuria Almanac! And if you raise your pledge over the threshold (currently less than $22), you can get 6 more titles, including the Bestiary and GM Screen! And while you do, you’ll also be supporting both Doctors Without Borders and the Bärenherz Children’s Hospice. Head to Bundle of Holding now! Second, a shipment of products has arrived at our warehouse, so we have a bunch of new items to offer in our Web Store! These products are not yet in physical stores, so this is your first opportunity to buy them individually! We now have all of the core books and accessories included in last year’s Warring Kingdoms Kickstarter, the first regional supplement for The Dark Eye that focuses on the turbulent region of Nostria and Andergast. This of course includes the Warring Kingdoms Sourcebook and Armory of the Warring Kingdoms, as well as the associated adventure, New Bonds and Ancient Quarrels. You can also find the Card Pack, Map Set, and Soundtrack for the region. Plus, if you love stories, you should definitely pick up the Hero’s Breviary of the Warring Kingdoms, a set of in-character writings that offer interesting perspectives on the regional conflict, and The Andergastan, a gorgeous full-color graphic novel! In addition to these new items, you’ll also see that we have received restocks of the Core Rules Pocket Edition and the new adventure anthology, Tales of Dragons and Thieves! 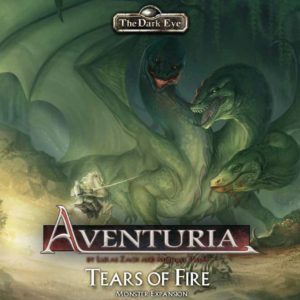 But most exciting for players of the Aventuria Adventure Card Game, we are thrilled to announce the first sales of Tears of Fire, the game’s first monster expansion! This expansion includes three different adventure paths to get your party to a climactic fight against a giant wyvern, one of the most terrifying creatures in all of Aventuria! With 4 different ages (difficulties) and 6 different possibilities for the dragon’s three heads, this expansion offers incredible variety and replayability. It even offers a many-versus-one dueling option where one player takes on the role of the dragon! 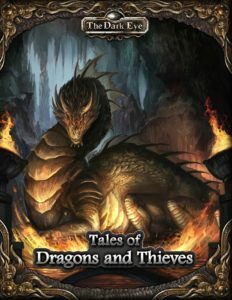 If you’re looking for a fun challenge, Tears of Fire is the expansion for you! Now that all of these books are available physically, we have added them to the Dark Eye section of our DriveThruRPG store as well! On top of the books mentioned above, we even have a few digital-only products that you’ll want to check out. 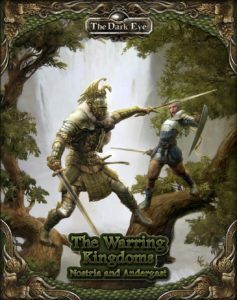 There are two new Heroic Works: Legacy of the Dike, which is set in Nostria to go along with your Warring Kingdoms adventures, and Turnip Harvest, which can go be used as a side story in the Theater Knights campaign. And if you enjoy paper miniatures for your table, you’ll want to grab the Warring Kingdoms Figure Flats Supplement, which includes figures not only from the Warring Kingdoms Sourcebook, but also some extras from the Core Rules and Almanac that we had previously skipped! Finally (whew! ), we have one more big store that you can access to get new and otherwise unavailable Dark Eye products! 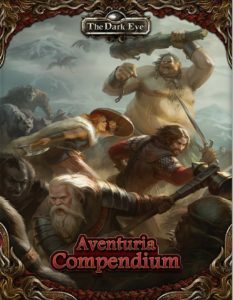 The Game On store for the Aventuria Compendium is currently open! If you backed this Kickstarter, make sure to complete your survey, and if you didn’t, this is your opportunity to get in on everything we unlocked! As always, we sell many of our products through our pledge management store, so if you are looking for good shipping deals outside of North America, this is your best bet. But we have more than just our usual offerings this time – we are happy to offer a rare opportunity to purchase the Hand-Bound Leather Limited Editions of The Core Rules and Aventuria Almanac. We are re-offering these magnificent volumes once again for a very short time, so head to the store now to fill out your collection!